Auction house Bonhams, of Bond Street, London, are to sell an original artwork created by the popular street and graffiti artist Banksy. The artwork was created as part of the Green Peace Save or Delete campaign. The work is to go on the auction block on the 11th January, as part of Bonhams' Urban Art Sale, and is thought to be able to fetch in the region of £60,000 - £80,000. 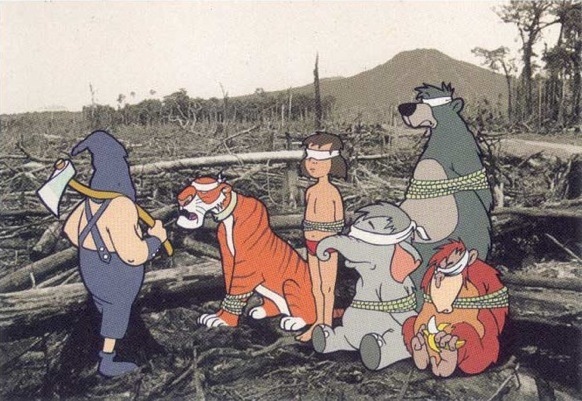 The unique artwork, which features some of the characters from Disney's The Jungle Book, was created as part of Green Peace's efforts to highlight the growing problem of global deforestation. As the characters sit in a ruined forest, in front of an executioner, they help Banksy to superbly comment on the state of global affairs where deforestation is concerned. By superimposing these extremely recognisable characters onto an image of a destroyed forest, Banksy brings the issue of deforestation, a little closer to home. The use of figures from the animation classic give us all a basis from which to relate to the issue. Unfortunately, the image never went into full print for the campaign due to protectionist policies at Walt Disney, but the image did make it into Banksy's book, Wall and Piece . The Bonhams sale takes place this coming Tuesday, and features 9 other works from the artist including Balloon Girl of 2005, Bomb Love of 2004, Rude Copper of 2002 and Have A Nice Day of 2002; a bonus for fans of the infamous street artist.